FASEB J 2011 25, 3661-3673. Nilotinib (AMN-107) purchased from Selleck. Effect of nilotinib on Bcr-Abl kinase activity in ABCB1- and ABCG2- overexpressing CD34+CD38- cells. K562 parental cells and CD34+CD38- subpopulation isolated from K562 cells were treated with nilotinib at 0.01, 0.1 and 1.0 umol/L for 12 h. Equal amount of protein was loaded for western blot analysis as described in the Experimental section. The experiments were repeated at least three times independently, and a representative experiment is shown. Molecules 2014 19, 3356-75. Nilotinib (AMN-107) purchased from Selleck. Inhibition of thymidine (a and b) and cytarabine (c and d) uptake with nilotinib. The legend is similar to Fig. 1, except that imatinib was replaced by nilotinib. Leukemia Res 2012 36, 1311-1314. Nilotinib (AMN-107) purchased from Selleck. Nilotinib up-regulates the ERK survival signal in prostate cancer cells. (B and C) Immunoblot analyses of DU-145 cells (B) or DU-145 cells in comparison with LNCaP and PC-3 cells (C) treated with nilotinib for the expression of phospho-ERK1/2 T202/Y204 and total ERK. Immunoblot for GAPDH is shown as a loading control. Urol Oncol 2014 0.1016/j.urolonc.2014.06.001. Nilotinib (AMN-107) purchased from Selleck. Immunohistochemical staining of xenografted DU-145 cells after 21 days of treatment with 75 mg/kg/d of nilotinib for phospho-ERK1/2 T202/Y204 expression. It can be noted that tumors explanted from vehicle-treated mice showed mostly positivity at the tumor periphery, whereas tumors explanted from nilotinib-treated mice showed a more evenly distributed phospho-ERK immunostaining (left panels). Quantification of phospho-ERK-positive DU-145 xenografts explanted after 21 days of treatment. Mean and standard errors of positive cells per high-power field (HPF; x40) from at least 3 tumors are given (right panel). 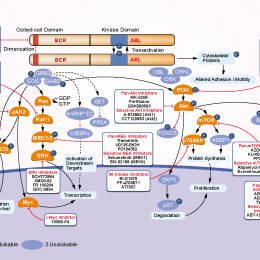 A selective inhibitor of native and mutant Bcr-Abl. 実験の流れ： Human primary Schwann and schwannoma cells are seeded on precoated 96-well plates. Nilotinib is added 40 minutes before stimulation with 100 ng/mL PDGF-DD, and cells are cultured for 72 hours (3 days). Because the half-life of Nilotinib is 18 hours, one-half of the originally added concentrations are added freshly every day. In addition to DAPI staining and determination of the total cell number, the more sensitive and accurate BrdU incorporation method is used to detect proliferating cells. Total cell amount (DAPI) and number of dividing cells (BrdU-positive) are blindly counted using an inverted fluorescent microscope and 200 × magnification. All cells in every well are counted. The total cell number per well differed between various cell batches and is 100–300 cells/well. Weisberg E, et al. Blood. 2007, 109(5), 2112-2120. Liu Y, et al. J Hepatol. 2011, 55(3), 612-625. Hochhaus A, et al. Cell Cycle. 2011, 10(2), 250-260. Ammoun S, et al. Neuro Oncol. 2011, 13(7), 759-766. Rhee CK, et al. Respiration. 2011, 82(3), 273-287. Weisberg E, et al. Cancer Cell. 2005, 7(2), 129-141. I would like to use AMN-107 for in vivo studies in mice, can you give me some suggestions about the in vivo formulation? For in vivo study, we recommend to use 4% DMSO+30% PEG 300+5% Tween 80+ddH2O up to 3mg/ml. 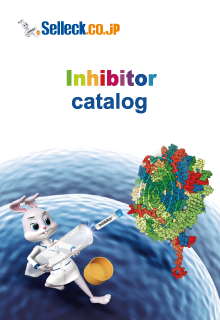 Imatinib Mesylate (STI571) : Multi-target inhibitor of v-Abl, c-Kit and PDGFR，IC50=0.6 μM/0.1 μM/0.1 μM.